I learned a few surprising lessons yesterday that, normally, wouldn’t be surprising. But before we get into it, lets talk about Los Angeles. It’s the nature of the beast (the beast being the industry that defines this town and everyone in it) to put its willing enablers to the test. For every person who is fighting and clawing their way to the top, there are a hundred more who couldn’t get there and gave up. Though this breeds talent and ambition, it also tends to breed cattiness and pessimism. And, more often than not, disappointment. But after talking to a panel of industry experts at the SimplyStylist.com Seminar who have seen the sunny side of success, the crowd of stylists, editors and designers — myself included — learned that success comes not from back stabbing and bitchiness, but kindness and hard work. Those were the words that were spoken by every panelist, which included (left to right): Brenna Egan, Refinery29.com Los Angeles Editor and former Vogue staffer; Jamie Krell, E! and Style Network Style Expert; Alexis and Kym McClay, Naven Designers; Jeanne Yang, Celebrity Stylist, who also collaborates with Katie Holmes on their clothing line, Holmes & Yang; and Shea Marie, CheyenneMeetsChanel.com Fashion Blogger. 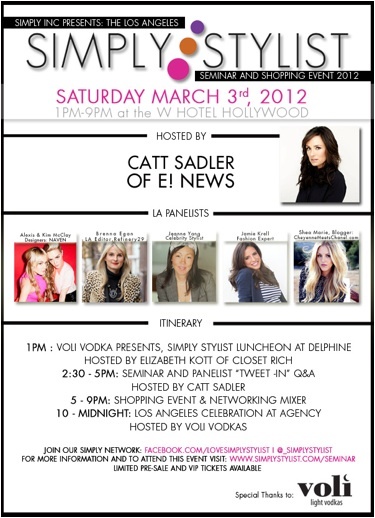 Hosted by Catt Sadler, E! News Host, the panel was held at the W Hotel in Hollywood, where the attendees were whipped into a fashion frenzy. After the seminar, we were let loose on the shopping boutiques in the next room. Forgive me for not taking more pictures (It’s time I got an iPhone, my Blackberry just isn’t working well for photos), because we were treated to a bar, DJ, photo booth and the hottest up-and-coming designers in Los Angeles. Jammy pack, anyone? No? Anyway, I especially loved speaking with Jeanne and Brenna (both of whom I STILL can’t believe I actually met — they’re amazing!). While building her business, Jeanne worked 120-hour weeks for three years straight. Just, take a moment to think about the dedication that requires. That’s 17.14 hours PER DAY. Her advice (directly to me! ah!) was that anytime someone gives you a negative, as she traced a small minus sign with her finger, “just turn it into a positive and give it right back to them.” She finished by tracing another line to make a literal positive sign. Her message was, always always be kind and grateful, no matter the circumstances, no matter how rude some people may be. Even if a Vanity Fair editor takes the credit for your work styling the biggest selling issue of the magazine ever (You know it — you probably had it, it was the Tom-and-Katie-present-Suri-to-the-world cover). To continue what I will now call the inspire-a-thon, I also got to chat with Brenna. Before starting at Refinery29.com three months ago, she had previously worked as the West Coast Editor for OK! Magazine. She was also once a Vogue staffer. (Side note: To get hired as an assistant, she sat through an 8-hour interview with “Anna and the team.” Vogue does not mess around.) Brenna meets seven deadlines per day to create the content for R29. Basically, she’s writing all the time. All. The. Time. So I asked what she does in the event she has writer’s block? For her, she says, “It’s not an option.” I love that. I love that! She has to meet her deadlines, so, she has to keep writing. And you know what? She does it so well. So that was my day, and it made me so excited to be in Los Angeles, to be an editor and to love fashion, over and over again. Special thanks to Sarah Pollack Boyd and SimplyStylist.com for hosting the event. Is it too early to buy my ticket for next year?